From Goodreads: In this exclusive insider account Mary Delahunty takes us behind closed doors to tease out thepersonal from the political and reveals the human cost of brutal modern politics. In Gravity we are eyewitnesses to history. Our first female Prime Minister, Julia Gillard came to power suddenly after the night of the long knives in a coup that perplexed the nation. She hurried to an election and was chained to a hung parliament. She out negotiated Tony Abbott and formed a minority government but the deepest threat was from within. The man she beat for the top job was to relentlessly undermine her for three tortuous years. In gathering material for the book, journalist and politician, Mary Delahunty had rare and unparalleled access to Prime Minister Julia Gillard, following her for her last 6 months. She was present at public speeches, party events and community cabinet. Mary was in her private office and the PM’s wider office during parliamentary sitting weeks, particularly witnessing from the inside the compelling dramas of the no-show coup in March and the defeat in June. Mary was the only journalist/writer to speak with the PM on June 26 ( the spill and caucus vote was that evening) and she has the exclusive conversation with the vanquished PM in her private office the Morning After. explores resilience in public life and the disposability of modern leaders. Thoughts: Reading this book made me sad. If you compare Australia's government today to what we had, what we could have had, it makes me angry. The treatment of Gillard, not only by those outside her party, but by those inside it is appalling. Whether you think it was her gender, her policies or a combination of both, no one can dispute that fact that no other Australian Prime Minister has been treated with such contempt and lack of respect for the office they held. I truly believe history will judge Gillard very differently from the way she was judged in office. In fact you only need to look at some of the literature around already to realise it started the moment she lost office. The saddest thing for me though is, as Delahunty points out, Gillard was never given the chance to truly what she could do. Attacked not only her opponents, one of her own (Rudd) worked incredibly hard to bring her down - ultimately succeeding and doing great damage to the Labor Party in the process. However, while leading a minority party, Gillard's government managed to get through 561 bills - including the National Disability Insurance Scheme (NDIS), Education reforms, National Broadband Network (NBN) and the carbon tax. I am, and always will be a Gillard supporter. I don't ever imagine a time when I am not angry about her treatment and the damage done to Australian politics by her detractors. Delahunty is obviously also a fan, but she does paint a picture of a less than perfect person. (which is only fair and right!) 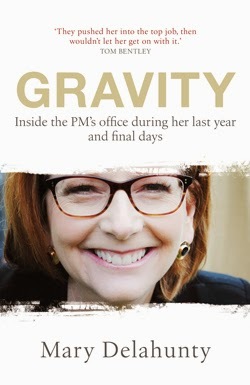 She examines some of the areas where Gillard failed and where a difference in her attitude or demeanor may have made a difference. In the end though, this book tells the story of an incredibly determined woman who would not be swayed from what she believed in. A woman who refused to let a bunch of white, middle class men with a huge sense of entitlement push her around. She fought and she fought hard. Since leaving politics she has conducted herself with dignity and grace. Love her or hate her, I challenge you to read this book and not be impressed by her.